Is the Balinese the Right Cat Breed for You? Is the Balinese right for you? Named for the grace and majesty of traditional Balinese dancers, the Balinese cat is an elegant and entertaining member of the household. Formerly known simply as a “long-haired Siamese”, the Balinese is the result of a naturally-occurring gene that produced beautiful long hair in purebred Siamese cats. As a result, the Balinese has many of the same characteristics cherished by Siamese cat enthusiasts: devotion to their owners, an outgoing personality, and keen intelligence – they’re considered the most intelligent of the long-haired breeds. Their silky soft fur lacks an undercoat, which means you can enjoy their long locks without the daily grooming that other long-haired breeds require, and shed very little. There are some claims that the Balinese is less likely to cause problems with allergies, but there is no firm scientific evidence to support this. However, it has been shown that they produce lower amounts of a particular protein allergen that may be responsible for an allergic response in some people. 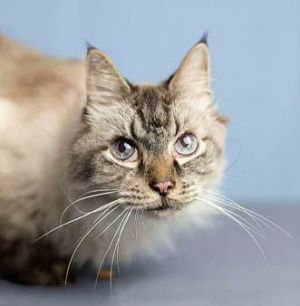 There are two accepted standards in the appearance of the Siamese, and thus also in their long-haired counterparts, the Balinese: traditional, and contemporary. Both styles are characteristically slender, graceful, and fine-boned, with long legs and tail. They have small, oval paws and large, pointed ears. Their eyes are large and almond-shaped, of varying shades of blue. Crossed-eyes occur occasionally, but don’t usually cause any health problems. Where contemporary differs from traditional is in the exaggeration of these shared features. In particular, the contemporary Siamese, and the Balinese developed from this line, have a noticeably wedge-shaped head with an elongated, tapering nose. The ears are longer and broader, and the body is extremely elongated and slender. The contemporary variety has a very delicate look. In contrast, the traditional style Siamese, and the Balinese developed from this line, appear somewhat sturdier, with a broader and rounder head (the Siamese breed is sometimes known as an “apple-headed” Siamese for this reason), with ears that are still large and pointed, but to a lesser degree than in the contemporary style. Both contemporary and traditional Balinese have a medium-to-long single layer coat. The hair should have a silky texture, and lay close to the body. A Balinese bred from two Balinese will tend to have a longer coat than one bred from a Balinese and Siamese. Both varieties should have a beautifully plumed tail. 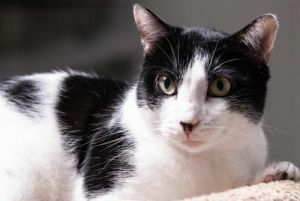 Coat coloration of the Balinese is in line with their short-haired Siamese counterparts: a white or cream-colored body with darker colored points at the face, ears, paws, and tail. Interestingly, the pointed pattern of the Siamese and Balinese is a form of partial albinism caused by a mutated enzyme that is responsible for coat pigmentation. The enzyme becomes heat-sensitive, and doesn’t work at normal body temperature, resulting in the white or cream color of the body. At the cooler point of the cat’s body – legs, tail, ears, paws, and face – the enzyme is able to activate, and fur pigmentation is possible. Because of this, cats born in hotter climates may have lighter coloration than those in cooler climates. While the body is always white or cream, the points may come in a variety of colors and patterns: seal (the most common), blue, chocolate, lilac, red, and cream, as well as tortoiseshell and lynx points. The American standard, however, only accepts seal, blue, chocolate, and lilac colors – all other colors and patterns are classified as a separate breed, the Javanese. The devoted Balinese is a cat lover’s cat. They are enthusiastic to demonstrate their affection to their owners, and they love to be touched, held, and interacted with. With an intense curiosity and an exceptional intelligence, you may find this cat to be keenly interested in what’s going on around the house. They are playful, and maybe even a little clownish, and are good at finding ways to amuse themselves. None-the-less, the Balinese should not be left alone for long periods of time, as they’re cat that thrives on social interactions – some enthusiasts even suggest that they should always be kept in pairs, so that they can keep each other company while their owner is gone. The Balinese should get along well with children and other pets. Like the Siamese, the Balinese has a reputation for being a bit demanding, with a tendency for frequent and persistent vocalization – in other words, if you don’t like the sound of a meow, the Balinese may not be the cat for you. Though they share the gift of gab with their short-haired counterparts, the Balinese is said to have a quieter voice. A wonderful cat for people (and dogs) who don't like cats. I reeeeally don't consider myself much of a cat person, but a recent roommate's long-haired Balinese won me over completely. This girl was so beautiful, intelligent, friendly, and loving that a person would pretty much have to have a heart of stone not to fall for her at least a little bit. I have two large dogs, and while they both love and want to play with cats, I've never met a cat who was very into that into this one came along. She would play with them and curl up on the couch for hours with them, and clearly considered herself part of the general dog family. The cat was equal parts playful and lazy, independent and clingy. Pretty much the perfect cat mix. She generally would sleep for much of the day and then chase invisible things and zoom around the house in the wee hours of the night, as cats do. She had absolutely no problems self-regulating her own food and keeping herself impeccably groomed, and never had an accident as far as I know. She didn't ever harass the fish or try to escape through an open window. She was perfectly content to curl up and cuddle, very much at the top of the pack of the house but was always the most graceful and benevolent queen of them all..